A Verb for Keeping Warm: Valentine's Day Party: I Love Ravelry! Valentine's Day Party: I Love Ravelry! Ok, we are cruising steadily along here. February 10th marked our 3 month anniversary in our new space. And the party, or the knitting party train, as I like to call it, continues! I think I have succumbed to to the idea that this is going to be - or it already is a Very Exciting Year (many more exciting announcements soon to come your way!). So, not long after Ysolda left, and life began to resume a tinge of normalcy, and I began to feel a bit of melancholy that the knitting party train had left me behind (Vogue Live), I received an email from Jess of Ravelry, proposing a Ravelry get together at the shop. Eek excited! Though admittedly a bit concerned with the amount of pre-Stitches work underway, how could I say no? One might think, that now that I have a staff, I might take some time to do other things in my life, like grocery shop, though no, apparently, I just plan more things at Verb! I have to take a moment here to express my gratitude for the lovely people who work at Verb - I adore you and know that without you I could never say yes to all of these opportunities!! Thank you for all of your help! Jess and Casey flew arrived on Sunday. We had it in mind to show Casey the beer side of town. We took Casey and Jess to The Trappist. Among all of the awesome beers they have, Jess found a favorite that she could sip on in her current state, Fentimans Dandelion and Burdock Root Soda. She discovered it in Scotland. I love the graphics on the bottle and that their tagline is Botanically Brewed - kinda makes me wish that we carried it in the shop! It was so nice to hang out with Jess and Casey before the madness of Stitches began. Typically when I see them, we are all so exhausted, so this gave us some time to catch-up. One of my favorite topics was talking to Jess about the baby and pregnancy! I don't have many friends who've been pregnant so this is an endlessly fascinating topic. I especially loved talking about potential outfits for the baby. Jess picked out some adorable fabrics at Verb for the little one! 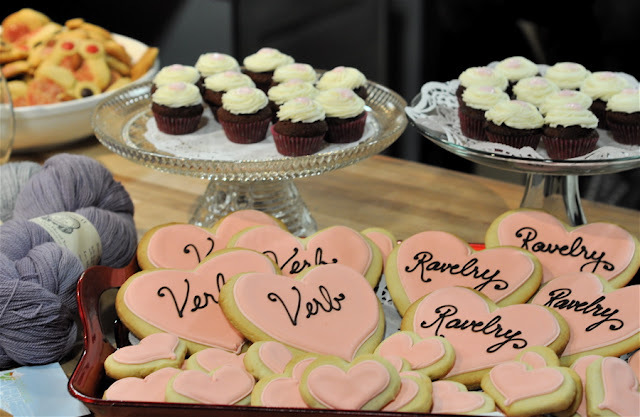 On Monday, Valentine's Day, Verb hosted an I Love Ravelry party. Alisha of Reverie Patisserie graciously made these beautiful cookies and cupcakes for the party! Write to Alisha and she will make you the tastiest, most beautiful cakes and cookies. I set up a preview of our new yarns in the gallery. Jessica with Grace, one of my favorite customers at Verb. Grace is wearing her High Road shawl by Mary-Heather Cogar, out of Metamorphosis in Pilgrim, one of the Pro-Verbial shipments. The lucky winner of a skein of our new yarn, Floating! The fact that a Casey and Jess came for an event on Valentine's Day was perfect. Ravelry has such a huge place in my heart. Right before I started Verb, working in a job that I had no intrinsic connection, and living a very large city, feeling rather isolated, life was a bit, well, sad. I decided to leave my job not knowing what would come next - a decision I found rather daunting and quite frightening really. Within a few months, wanting to reconnect with the dyeing practices I had learned in India, I had started Verb, and began to participate on Ravelry. At that time, Ravelry was also relatively new. It has been an amazing experience watching Ravelry grow - the website, Casey and Jess, and the addition of Mary-Heather and Sarah. I honestly can not say where my business would be without Ravelry - moreover, personally, what my life would look like. I have met so many people through Ravelry. People who are now my friends and whom I consider my community. Thank you Casey and Jess for making Ravelry! One thing I truly love about Casey and Jess is that they are so genuinely vested in Ravelry. It is like a giant knitting project that they both work on and are completely conscious of the way this knitted garment functions, looks, and feels. They keep creating sleeves so that we can all put the knitted garment on. Like a gigantic octopus! Whoa! Ok, back it up! But really, I give so much love and adoration to Casey and Jess for their courage and resilience in creating something with care and attentiveness and allowing all million + of us to have a place in it. In my own experience, I can relate to caring about something so much, Verb, and sometimes feeling like my heart is on my sleeve. I know, perhaps not the best business approach, but sometimes the reality of loving what you do. You care. And in that care, there is a vulnerability that is both thrilling and devastating. Perhaps, if you haven't all ready, this is the year for you to create something slightly larger than yourself, and place it in the world. I will be here for you if you do. Because really, caring is not wrong. It's something to celebrate! Thank you to everyone who made it to our Valentine's Day party - and for personally saying thank you to Casey and Jess. p.s. I really, really want to write about Tnna - more importantly the YARN at Tnna - because I was in heaven. And I am going to - very soon. It's just a BIG OLE LOVE FEST over there at Verb. I'm happy to be part of the lovin'. Thank YOU for the beauty of Verb and for making a fantastic home away from home for all us fiber and fabric junkies. I l-o-v-e VERB! Thank you for being. Indeed! Avfkw is a great place to gather. You are all building community. It's all about the people. Fiber, chocolates, color, staff, Cleo, and snacks don't hurt either! What is that cute little sweater in the picture? What is that cute little sweater in the picture? I'd love to have the pattern! It's a good thing to be with your friends on valentines.